By now, it is a known fact that the Empire State Building was lit up to commemorate the 60th anniversary of the formation of Communist China. God help this country. Last year, the Marine Corps had asked that the landmark be lit up in scarlet and gold on November 10 to honor the 233rd birthday of the Corps. They were flat-out told no. But yet it'll be lit up for the same kind of ideology the Corps has fought against for so long??? The world has turned upside down. Also last year, the building changed its colors to honor such occasions as The Cat Fancier's Association's Cat Championship, the release of Mariah Carey's album, and the 58th anniversary of the European Union. Why not for the Marine Corps? Building officials said an anniversary as obscure as a 233rd doesn't meet their "standard" for lighting events. An album release or a cat convention does? What the hell is wrong with this picture? For the owners and administrators of the Empire State Building to disrespect this country and the Marine Corps like this is outrageous. Not only is it unpatriotic, but I would add that it borders on giving comfort to potential enemies. I guess they figure if the White House will fly the Chinese flag, then lighting a tower must be the right thing to do. I recently commented that I'd like to visit New York City once in my life. With all the crap happening there from this incident to wanting to ban smoking outside, I won't be taking a bite of the Big Apple. I'll spend my tourist dollars elsewhere... like Cleveland. Hi B & G Fan! This is an excellent post. 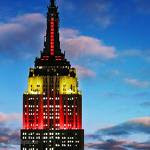 I knew they NYC clowns had lit up the EPS Bldg for the Commie anniv., but I did NOT know that they denied our BRAVE MARINES! This is an outrage. I'm glad you brought this to our attention. I will never visit New York either, I never had, and never will. If I want a dirty, corrupt crappy city filled with vile putrid crooks and commies, I can just stay home. I think I'll send Walter the Squirrel to put the beat down on whoever thought up this idiotic idea. No doubt it's some rich liberal who donated to obugger - those commies are all alike. Bunni: It made me furious also. I don't know if you saw it, but I commented on your site that Walter is my new hero!! Cheyenne almost peed her pants over that commercial. OOOOh, you said landmark. My mistake. Hardy-har-har-har! Been waiting to use that forever. Sharky: Glad you got the chance to use it! It is unbelievable that the Empire State Building is willing to light up for such trivial events, and for communist China whose belief is anti-freedom, and NOT for our brave heroes in the military. This is utterly disgraceful. These liberal commies in the Obama administration, and the top commie Obama must be stopped. And, they wonder why we call them unpatriotic. To be truthful, at this point, the Chinese probably OWN that building. Someone really needs to put the smackdown on all these libs. I suggest the Marine Corps! Dr. Dave: Sad, but probably close to the truth. I think it is safe to say China has accomplished the 2nd. Trestin: Welcome to my little corner of the world! Unfortunately, you do have a point. Who would've ever thought it possible?